One of my Polish Peeps posted this picture on their Facebook Feed. Apparently one could go inside last weekend because Chicago was having it's annual Open House. a free public festival that offers behind-the-scenes access to 150 buildings across Chicago. The selling point being that you will "explore repurposed mansions, hidden rooms, sacred spaces, private clubs, iconic theatres, offices, hotels and more—all for free." Actually, for this place and I think one or two other buildings, you needed to pre-register for places like this because, security. What is the difference between an embassy and consulate? I imagine size and day to day activity so I looked it up. While the terms embassy and consulate are used synonymously, the two are very different. An embassy is the larger and more important of the two and is described as a permanent diplomatic mission which is generally located in a country's capital city. By contrast, a consulate is a smaller version of an embassy and is generally located in the larger tourist cities of a country but not the capital. There are special cases and several unique situations making some examples complicated. I've been inside this building three times; once for a (Society of Young Polish Professionals (SYPP) social event and twice for Christmas Parties. Not speaking much Polish was definitely a liability in all those cases. The decor is very traditional and old, it looks like the parlor time forgot. 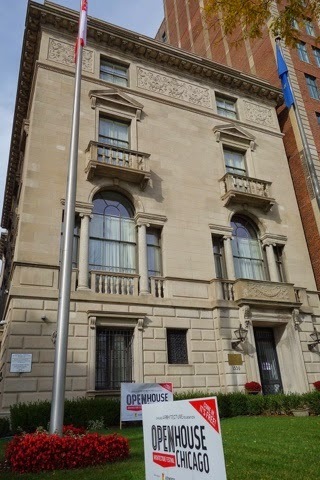 And so a post that was just meant to be a picture of the Polish Consulate and some throwaway text becomes a post about a group of Poles I met in the early 2000. One of my Polish Princess friends tried to start a social group with the intention of networking young polish professionals with the idea that we could help one another start businesses, land jobs and get laid meet a polish person one could take home to mom and dad. This was before LinkedIn and Meetup and it never really saw the light of day because of a variety of reasons. Another group called Polish Happy Hour (PHH) leveraged technology, specifically a free yahoo group, and managed to pull off more of what Polish Princess wanted. PHH petered out around 2009 for various reasons as well, particularly because there was no strong recruitment for new members.